Alice Springs musicians and song writers are now better educated about marketing and legal aspects of their industry after workshops presented by industry advocate Music NT earlier this month. 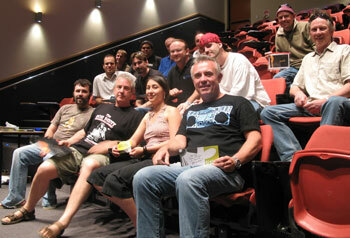 The workshops held at CDU Alice Springs’s new higher education lecture theatre were attended by around 20 musicians and featured Buzz Bidstrup, founding member of the Australian band The Angels and producer with Jimmy Barnes, and Paul Christie, founding member of Mondo Rock and industry band manager. The presentation was made over two evenings and covered song writing, production, career planning, self-marketing and the legalities of music writing and production. Music NT Alice Springs co-ordinator Rory Davis said the two-day event was well attended. CDU VET music lecturer Cain Gilmour helped to facilitate the event. He said it was popular with musicians across age groups and interests. Local musician Barry Skipsey said he valued the presenters’ recall of their experiences. ‘I was surprised how much I gained from the seminar and I realised the insight these industry heavyweights were giving to the young people would benefit them immensely,’ he said.